LAB in Physical Properties, Polymers, Mixture, Scientific Method. Last updated July 16, 2018. MS-ETS1-2: Evaluate competing design solutions using a systematic process to determine how well the meet the criteria and constraints of the problem. 3-5-ETS1-3: Plan and carry out fair tests to which the variables are controlled and failure points are considered to identify aspects of a model or prototype that can be improved. Understand what makes a substance a polymer. Identify various examples of physical properties. Design a controlled experiment, following the outline of the scientific method. Do not allow students to heat the flubber, it will quickly become very sticky, like glue and will burn the skin when touched. Students should be placed in pairs for this lab. The amount of flubber produced from following the procedures should be plenty to use for each lab pair. The flubber can even be separated into equal pieces so students can conduct multiple trials for comparison. When making the flubber it is very important that the borax solution be added slowly, and stirred frequently. It should not all be added to the glue mixture at one time. The flubber should not be sticky when it is completed, it just be easy to form it into a ball, break it into pieces, etc. The food coloring will not stain once the flubber is completed. Will the size of a flubber ball effect the height of its bounce? When students create a hypothesis, encourage them to use the structure: If… then… because…. This requires students to make a prediction, but also pushes them to justify their thoughts with a reason for their prediction. In this lab you will make a polymer. Polymers are large molecules with interesting properties. You will have an opportunity to investigate a property of your choosing in this lab as well. Polymers are large molecules that are built from small molecules called monomers; these monomers are like links in a large chain that forms the polymer. You see and use polymers in your everyday life. Polymers make up things like: plastic bottles, carpets, clothing and rubber. What is a physical property? Give at least three examples. What are constants in an experiment and why are they important? Follow your teacher’s instructions for cleanup of materials and disposal of any chemicals. Do not heat the flubber, it will quickly become very sticky, like glue and will burn your skin when touched. First you will create your flubber polymer. In a plastic cup create mixture A by combining ¼ cup or 60ml of warm water, 1/3 cup or 80ml of white glue and 1-2 drops of food coloring. Using a plastic spoon, thoroughly stir the mixture until it all looks the same. 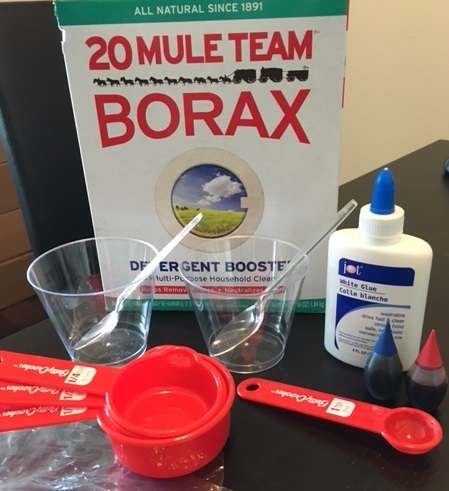 Next, create mixture B: In a separate plastic cup combine 1 teaspoon or 5ml of Borax Powder and 3 tablespoons or 40ml of warm water. Using a plastic spoon, thoroughly stir the mixture until the Borax dissolves (a tiny amount may not dissolve, and that is okay). Using the plastic spoon in mixture B add a couple spoonful’s of the Borax solution to the glue, mixture A. Stir. Keep adding mixture B to mixture A slowly, and stirring after each spoonful. The flubber will begin to form, and the consistency will change as you combine the mixtures. When you have added all of Mixture B to Mixture A, it may be easier to mix them together using your hands. The final flubber should not stick to your hands. Decide on an independent variable first, this is water you would like to change on purpose. Record it below in the planning table. Decide on a measureable dependent variable next, this is what you will measure as the result. Record it below in the planning table. Make a list of conditions you must keep constant throughout the experiment. Record it below in the planning table. Take these items to your teacher for approval before continuing. When your design has been approved, create a hypothesis, materials list, detailed procedure, and data table in the space provided before beginning your testing. What were the results of your experiment? Do your results support your hypothesis? What improvements or changes could be done that would make this experiment more efficient in the future?